At the cemetery’s dedication ceremony, Colonel E.D. Baker said, “The truth peals like thunder in our ears—thou shalt live forever!” “He meant,” This is San Francisco says, “that there, beneath the pines and the oaks and the bending willows, the memory of the sleeping dead would be forever green.” Baker was a lawyer who made a name for himself several years later when he defended Charles Cora on a murder charge. The jury couldn’t reach a verdict, but the Vigilance Committee did. They hauled Cora out of jail and lynched him. Baker left town. Cora was buried in the Mission Dolores Cemetery. The first burial took place on June 10, 1854. John Orr’s headstone was inscribed: “To the Memory of the First Inhabitant of the Silent City.” According to Findagrave, the headstone was destroyed when his body was moved to Holy Cross Cemetery in Colma, California. One of the early burials in the cemetery was James King of William, editor of the Evening Bulletin. He published articles pointing out the less than savory past of supervisor James P. Casey. On May 14, 1856, James King of William was shot in the street by ex-convict James Casey. He died a few days later. Casey was arrested and lynched by the San Francisco Vigilance Committee. King of William’s coffin was followed to the Lone Mountain Cemetery by a procession of 6,000 mourners, according to The Spectactular San Franciscans by Julia Cooley Altrocchi. Early in the 1900s, his family reburied him in Cypress Lawn Memorial Park with what looks like his original headstone. United States Senator David C. Broderick was killed in a duel by the Chief Justice of the State Supreme Court on September 13, 1859 on the shores of Lake Merced. He was buried on a hill in Lone Mountain Cemetery under a monument “with classical figures and tablets, inscribed with tribute,” according to The Spectactular San Franciscans. By 1860, they’d realized that the Lone Mountain Cemetery was too big and unwieldy. On August 16, 1860, Archbishop Alemany bought some of the land to found Calvary Cemetery on the western edges of the Lone Mountain. He consecrated the 49.2 acres and began to bury Catholics there. The Masons followed suit in 1864, buying 30 acres bounded by Turk, Fulton, Parker, and Masonic Streets, to build a burial ground for their members. The graveyard’s most famous resident was Norton the First, Emperor of the United States and Protector of Mexico. Masonic Avenue took its name from the cemetery and the placement of the graveyard explains the weird dogleg the street takes. The University of San Francisco sits on the old Masonic Cemetery land today. Local historian Michael Svanevik remembers watching students finding bones working their way up through the lawns on campus. 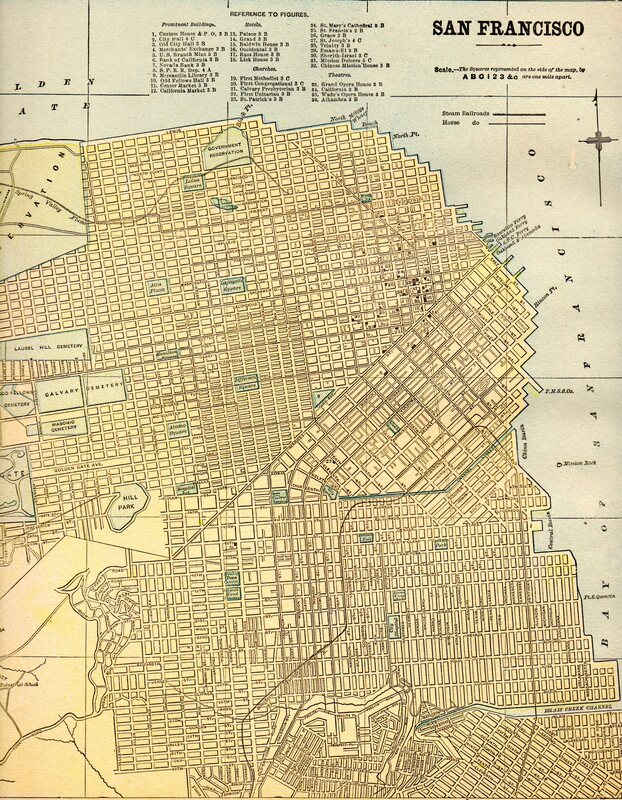 The Odd Fellows also bought 30 acres bounded by Geary, Turk, Parker, and Arguello in 1865. Their 1898 Columbarium is the only surviving element of any of the four cemeteries that still stands in place. The remaining cemetery was a mere 54 acres. Now that the Lone Mountain Cemetery had been separated from the Lone Mountain proper, a name change was in order. In 1867, the trustees voted to rename the cemetery Laurel Hill, after the lovely garden cemetery in Philadephia above a bend of the Schuykill River. Still, the cemetery’s days were numbered. The seeds of its destruction were planted in 1863 when Sam Brannan opened the Cliff House Resort overlooking the ocean. It attracted the wealthy people to Ocean Beach, but travel over the miles of sand was difficult. 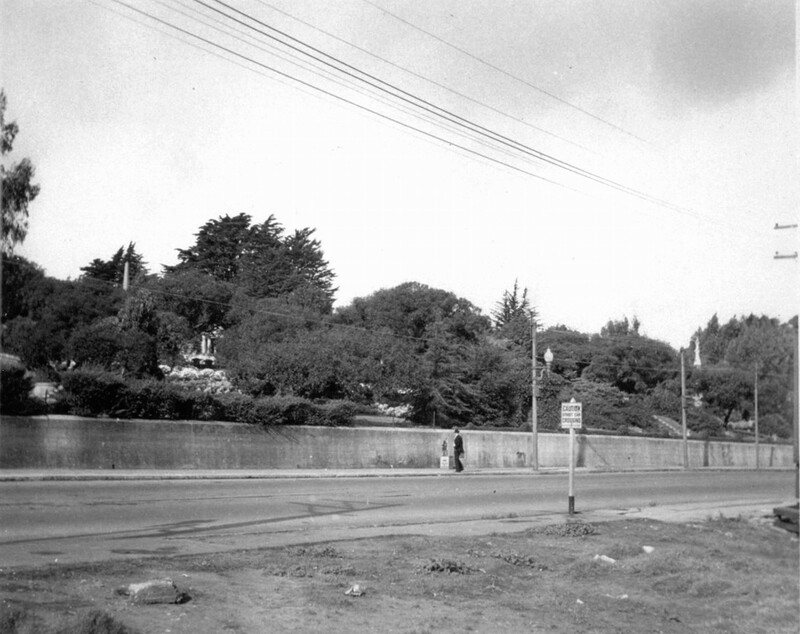 In 1864, the Point Lobos Toll Road, now called Geary Boulevard, was built to carry folks from the city to the ocean. It prompted many downtown businessmen to move out along the road and set up shop to cater to tourists. The first exhortations to “Remove the cemeteries!” began in 1880. Without perpetual care funds, families were left to take care of their ancestors’ graves. Since many of the pioneers came out to San Francisco without family or friends, no one cut the weeds or washed the headstones. Vandalism began to be a problem. By 1900, the cemeteries were on their way to being filled. That year, Mayor James Phelan signed the order forbidding burial inside the borders of San Francisco after August 1, 1901. In April 1906, the great earthquake caused wide-spread damage to monuments. Most no longer had family to repair them. There is a record of how lovely the graveyard once was. A photograph by Ansel Adams in the collection of the San Francisco Museum of Modern Art is called “The White Gravestone, Laurel Hill Cemetery, San Francisco.” It was take around 1933, after the cemetery was fighting to survive. The gelatin silver print was made around 1972. It shows a grave monument adorned with a mourning woman, leaning on her elbow against a plinth with an urn. Some of the inscription reads Lucy Ellen, aged 26 years. Behind the lichen-pocked stone is a balustrade, long grass, and shadowy trees. For a while, preservationists lobbied to preserve some of Laurel Hill’s most illustrious residents in a Pioneer Park. I came across photos of it by accident while I was researching in the wonderful reference library at 20th Century Fox. 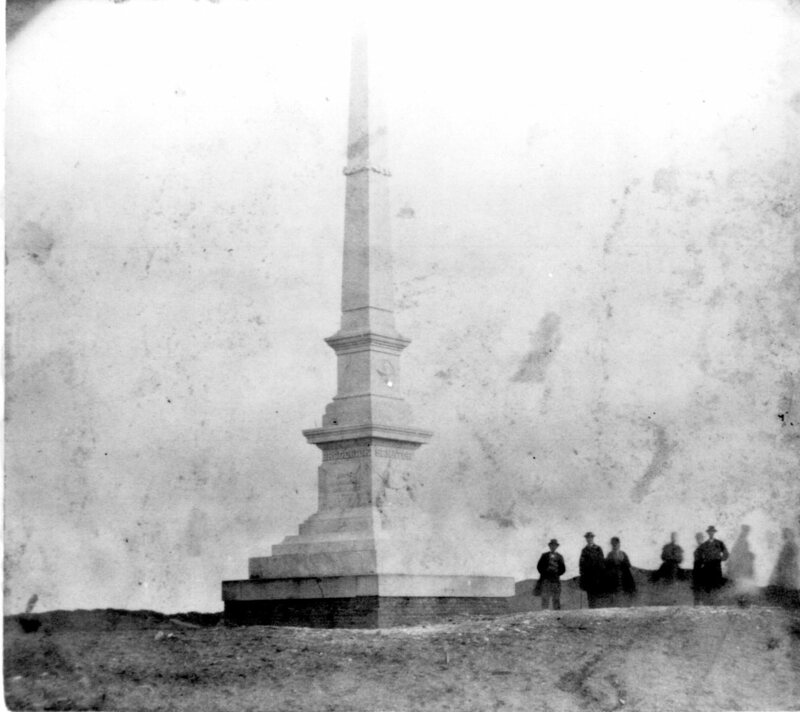 Broderick’s great column, arguably Laurel Hill’s most imposing monument, was destroyed in place. “Some of the blocks that formed the monument had been piled to one side, but others had been tipped into nearby graves and left there,” according to This Is San Francisco, whose author walked through the old cemetery once it had been abandoned. Broderick was a bachelor, so he was packed off to be buried in the Pioneer Mound at Cypress Lawn. “Over a rise and around a bend” stood a modest five-foot-tall shaft to the memory of Andrew Smith Hallidie, who had died in 1900. His epitaph read, “Inventor of Cable Railway System. Builder of First Cable Railroad. A Loyal Citizen.” Even though Hallidie designed San Francisco’s iconic cable cars, the city apparently felt no loyalty in return. 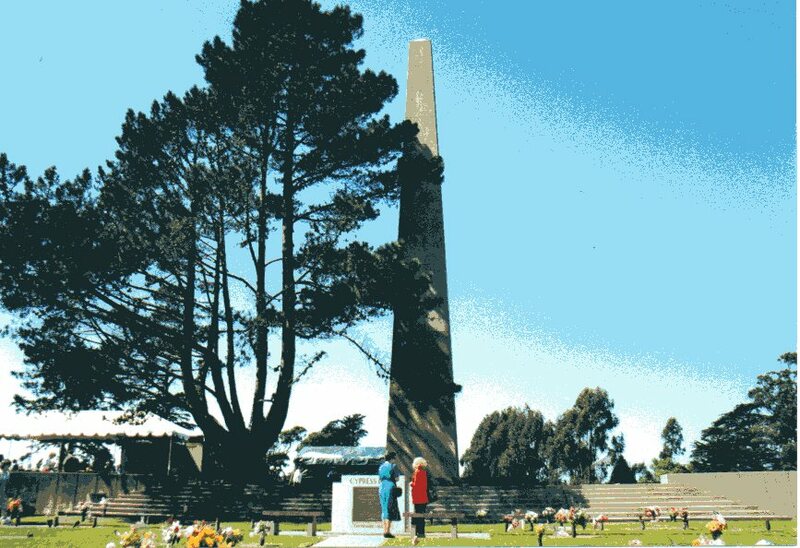 When no family stepped up to pay to transport Hallidie’s remains to a new grave in Colma, he was transported with all the rest of the unwanted to a tumulus at Cypress Lawn. His monument was hauled to Ocean Beach to shore up the sand. At the intersection of Walnut and California Streets, a bronze plaque on the wall around the Laurel Heights campus of the University of California in San Francisco used to read: “Former site of Laurel Hill Cemetery 1854-1946. The builders of the West, Civic and Military Leaders, Jurists, Investors, Artists, and Eleven United States Senators were buried here — the most revered of San Francisco’s hills.” California Registered Historical Landmark Number 760. The plaque was placed on May 31, 1961 — fifteen years after the cemetery was dismantled and its monuments hauled out to Ocean Beach to serve as a base for the dunes. In July, when I walked the borders of the old cemetery, even the plaque was gone. All traces of the cemetery have been swept away, except for the Laurel Hill Shopping Center and the names of the old carriage roads that crossed the graveyard: Walnut, Laurel, Spruce. This entry was posted in Cemetery of the Week and tagged Bay Area cemeteries, Cypress Lawn Cemetery, Laurel Hill Cemetery, Lone Mountain Cemetery, pioneer cemeteries, san francisco cemeteries. Bookmark the permalink. This is a great article and a treasure trove of history. I’m especially fond of this history as we used to live in the area. Too bad that the garden cemetery movement seems to be giving way on a universal level to less land for the people’s enjoyment and cultural development. We seem to be regressing into barbarism. My thoughts, exactly. 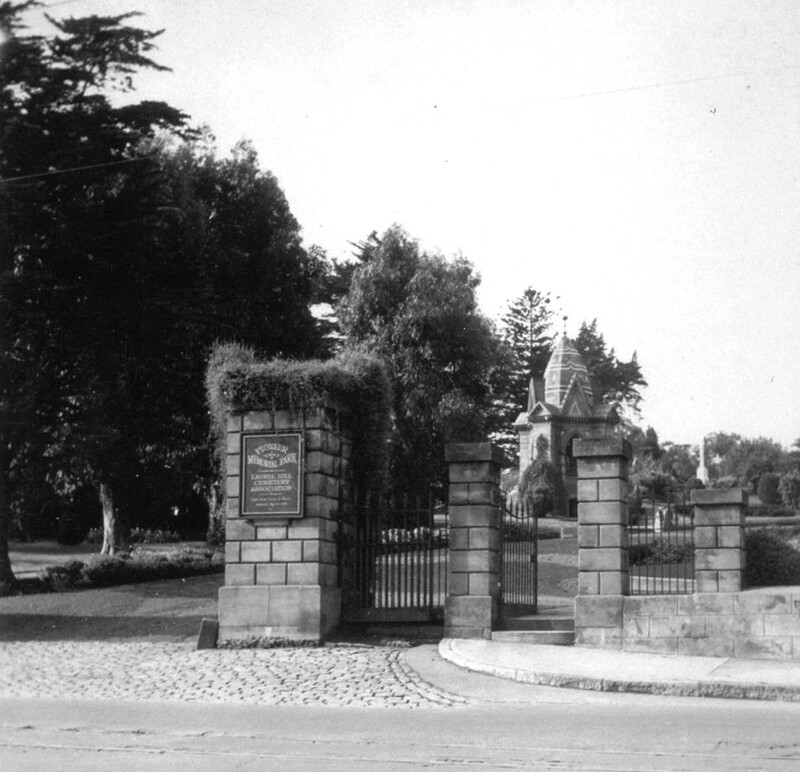 I love the idea that it used to be perfectly acceptable to go to a beautifully landscaped place, take a picnic, read a book, enjoy the sun and the birdsong, and just relax in the cemetery. I would have loved the Pioneer Park full of San Francisco history so much! It broke my heart that even the historic plaque is gone now. Great post! It is sad that such a beautiful cemetery destroyed.